Cost of Inaction | PRICE CARBON NOW! The potential cost of inaction is estimated to be as high as 14% of average world consumption per capita.5 Several costs of inaction have been projected including those that can be easily valued in economic terms e.g. 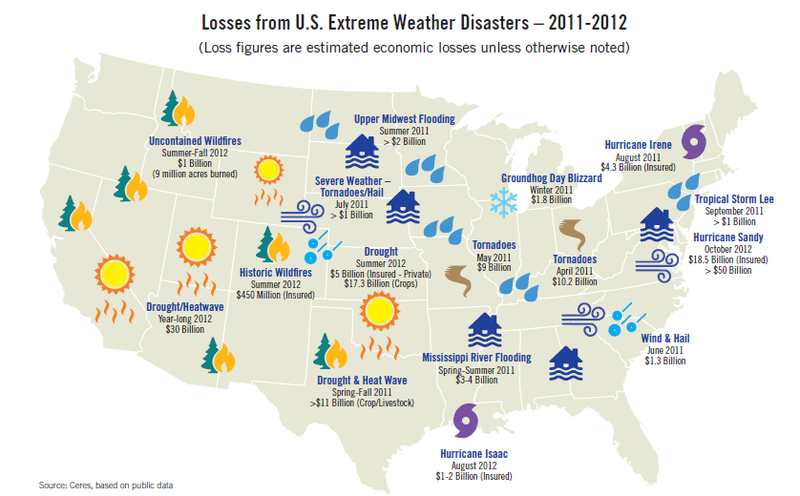 agricultural and forestry sector losses, and those that are more intangible e.g. cost of biodiversity loss and climate change-related catastrophic events.5 Globally the climate costs were projected to be US $ 1322.45B in 2030 and US $ 3384.46B in 2050.6 Delayed implementation of mitigation efforts (from 2005 and 2025) was estimated to cost US $ 340B in 2050 worldwide since more drastic measures would be required to achieve emission reduction targets, and because of deferred investment in research into clean and emissions reduction technology. Additionally, delayed implementation would make it impossible to restrict global surface temperature to 2oC by 2100, which would result in more catastrophic events and additional costs. This video by the Climate Reality Project describes some of the major costs of carbon pollution. In 2011, the National Round Table on the Environment and the Economy (NTREE) concluded that the costs of climate change for Canada could be $ 5B per year in 2020, and escalate to $21-43B per year in the 2050s.10 Other reports have come to similar conclusions: in the absence of mitigation efforts, climate damages were projected to cost US $ 16.97B in 2050 and US $ 43.42B in 2100. 1. Explaining extreme events of 2013 from a climate perspective. Bull Amer Metero Soc 95, S1–S96 (2014). 2. Armstrong, B. G. et al. Association of mortality with high temperatures in a temperate climate: England and Wales. J. Epidemiol. Community Health 65, 340–345 (2011). 4. Fischer, E. M. & Knutti, R. Anthropogenic contribution to global occurrence of heavy-precipitation and high-temperature extremes. Nat. Clim. Change advance online publication, (2015). 5. Kemfert, C. Global Climate Protection: Immediate Action Will Avert High Costs. DIW Berl. Wkly. Rep. 1, 135–141 (2005). 8. 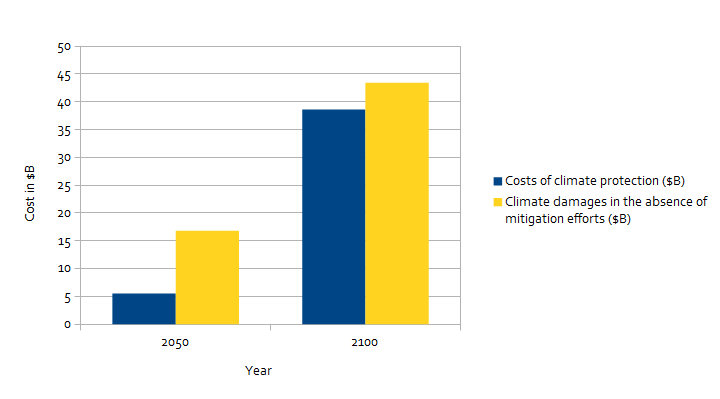 Ackerman, F. & Stanton, E. The cost of climate change. (National Resources Defense Council, 2008). Available at http://www.nrdc.org/globalwarming/cost/contents.asp. 11. CBC News. Extreme weather cost Canada record $3.2B, insurers say. (2014). Available at http://www.cbc.ca/1.2503659. 12. CBC News. 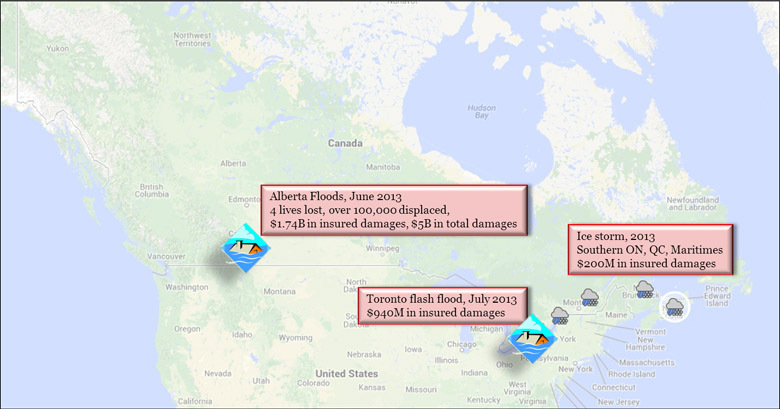 Alberta flooding claims at least 3 lives. (2013). Available at http://www.cbc.ca/1.1325013. 13. CBC News. Alberta floods push federal deficit to $3.8B. Available at http://www.cbc.ca/1.2445464.